Made from 100% recycled materials, each STORViNO Wine Storage Container holds up to 6 bottles. Solid polyethylene construction with convenient hand slots make it easy to transport and safe to stack. Be space-conscious and planet-conscious Our super-popular modular crate just got better—it got green! Made from 100% recycled materials, the STORViNO Nero Wine Storage Container, now in black, has all the same space-saving benefits of the original, holding up to 6 wine bottles* compactly. Solid polyethylene construction with convenient hand slots make it easy to transport and safe to stack. Sold individually. *This wine rack will accommodate bottles that have a diameter of 3-3/4" or less. BEST ANSWER: The STORViNO Nero Wine Storage Container is designed to hold six bottles of wine and there are no dividers. Each container is made from solid polyethylene construction with convenient hand slots to make it easy to transport and safe to stack. No - the unit is one piece of molded plastic. Very durable and useful. Have purchased multiple units for both storage and transit. No, each box is independent and holds six bottles. They can be stacked vertically or horizontally. No, the crates are designed for six bottles with fixed divisions. No. They are molded in place just like a milk carton crate. BEST ANSWER: The dimensions of each Storvino Nero Wine Storage container is 10-1/4"H x 11-3/4"W x 8"D.
Each container is 10-1/4"H x 11-3/4"W x 8"D.
Will a champagne bottle fit? BEST ANSWER: This wine rack will accommodate bottles that have a diameter of 3-3/4" or less so it really depends on the size of the Champagne bottle. It really depends on the size of the bottle. This will hold bottles up to 3-3/4" in diameter. What are the external dimensions? I need to know how many units will fit my space. BEST ANSWER: The dimensions are 10-1/4"H x 11-3/4"W x 8"D.
Can this Storvino be used in a refrigerator as well for storage? how many of these can you safely stack on top of each other? BEST ANSWER: A single column will be far less stable than two or three wide. I have 8 high x 3 wide with securing corks installed between the columns and it's rock solid. STORViNO® modules are extremely strong. The weight of each module when filled with 6 bottles is actually distributed to the vertical stacking guides. You can stack them one on top of each other as high as you desire. However, we recommend that you stack them not higher than 10 modules per vertical stack. Really, most people cannot reach that high anyway! I would suggest no more than 4 units tall. Not a showcase design but very practical and study. Good functionality. Some bottle shapes tend to slide out easily when you lay the case on its side. Very sturdy, easy to assemble, very functional. I was disappointed that some of my pinot noir bottles will not fit. I purchased 6 units to put into a closet replacing the stacked cardboard boxes. Loved them. Immediately purchased another five units - four for the closet and one to transport wine in. They are sturdy, stack easily, and hold most bottle sizes. Will purchase more as needed. Would make a great gift for wine loving friends. I use this product on our houseboat to store our extra wine and liquor - It fits regular wine bottles just fine but if you had larger ones or some larger liquor bottles they dont fit as well or at all... It does great for what it was made to do - I was just hoping to make it work for my personal usage. 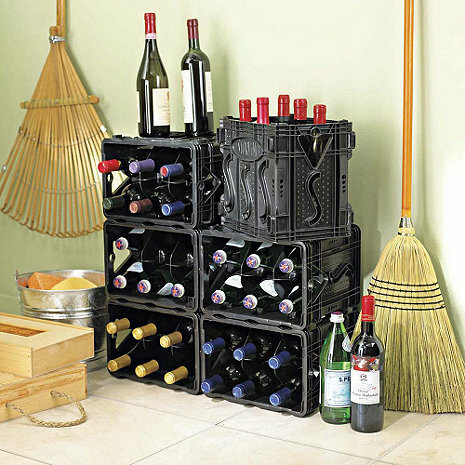 best I have found to get even close to accomplishing storage for bottles of wine and liquor - they are sturdy and work better than anything else I have found. I use these storage containers for the transporting of wine bottles for sanitizing, rinsing, and filling in the wine-making process. Very well designed product where form follows function no frills just what you need to store and carry wine easily. We love this product. It works very well for most our needs. Our only complaint is that it does not hold our larger bottles of Pinot Noir. So, we've had to buy alternate racking for those bottles and now have a cellar with a hodge podge of racking. Loaded two basement level "closets" with these. They are sturdy and stable. Only down side is the individual slots are a bit undersized for a number of 750 ml bottles. Not a big enough issue to cause buyer's remorse. Not real decorative, but very functional. These units work great in the space we have. We'll probably order more of them. besides buying for myself, I added wine and gave as gifts. Great storage solution for people with small spaces to store wine. Stacks beautifully and even holds Rhone style wine bottles. Storvino containers can be constantly added to and reconfigured. They can be commandeered to serve as 6-bottle carriers. I used the product in some unused kitchen cabinet space. The module design made it easy to slide in. Cleaned up scary cellar wine storage from dusty, funky cardboard cartons as surprise for spousal unit. What a reaction! THE BEST. Anyone drops the big one: Wine's packed and ready to go. What a brilliant idea. We bought two...they fit perfectly on the shelves in our garage! They are lightweight and can be adapted to many spaces ...very versatile! Solved our problem storing wine. We like to buy a case at a time of assorted wines, so much better than cardboard boxes. So glad we ordered them. Would definitely recommend them. Price is right too. I LOVE the Storvino Wine Storage Containers. They are very sturdy when stacked. They take up so much less room than storing the wine box on its side, since I donâ? ?t have a wine cellar. A few of my wine bottles were wider and didnâ? ?t fit. I will drink those first, haha! We have a 150+ bottle wine cellar but I often buy cases and flights so sometimes it's full. These are perfect for overflow so I don't have a lot of boxes by the cellar. They are efficient yet attractive enough to store extras. We have several of these wine storage containers and have been very happy with them. Since our collection is getting larger and our bottle price is going up, we decided to order a wine cooler that will keep the temp consistant and will hold up to 160 bottles. This is my 2nd purchase of these units. Hotizontal or vertical mounted, they can't be beat. Really fast shipping! I purchased 10 of these in a previous order and found them to be a perfect way to store wine. I wanted something easy, compact and environmentally friendly all at a decent price. These filled the bill perfectly. And because I was happy with my first 10 I ordered 8 more. Highly recommend. I am very happy with the Storvino storage unit. I am finally organizing my wine properly. I use the unit in the garage. I like that it won't be affected by any moisture that can occur in a garage. What makes STORViNO great for us is that we can grow our storage with our collection which makes for better use of our spaces for storage, our finances, and our environment. Excellent! I have a rather large wooden rack -- but it's full. These units are fabulous, they stack right next to my wooden rack, same height, very conveniently sized -- I bought three the first time, and have already gone back for two more. I am very pleased with this purchase. Picked up two of these crates - love them. Take them to the store to buy my wine, transport it to friends, store the wine in it at home, and especially ideal for use in our camper. Great storage for the price! These little containers make really good sense. Very easy to fit in to existing closets for our wine. Thank you Wine Enthusiast for having these. Great for trips to the wine store where we attracted a lot of comment. Better than cardboard boxes. Great for taking a wine selection on a road trip. We own two, so getting a dozen bottles to travel with us in the car is NOT a problem. Very sturdy. Exactly what I wanted!! I like the fact that the Storvino units fit together securely and easily and can be arranged and rearranged according to my stock. A must have for wine shoppers! We take it with us to the wine store when we go shopping. Everyone thinks it is a great idea (especially the checker) and wants to know where we got it. Delivery was incredibly fast, even though it was the height of the holiday shopping season. Service was professional and friendly. Much appreciated. While not the most attractive items I've purchased from the catalog, they are wonderfully practical. We converted a cabinet into a wine cellar! Works GREAT! Orders arrive quickly. Product is exactly what I was looking for. Love how stackable they are. We were looking for wine storage for use in our trailer; this is perfect! Great Storage AND Transport Solution! Delivery was prompt and the boxes were in great shape when they arrived. No customer service needed, because everything was fine. I have 9 containers. I spent an hour and 20 minutes clearing off three closet shelves and 15 minutes setting up the containers and stocking. Now have storage capacity for 72 - 91 bottles, depending on bottle size stored on top of the containers. Could not be more satisfied. Item came within a few days, even though it was on "BO". This item is perfect for me. I only keep a few bottles at a time therefore it keeps them safe without being extremely space consuming. I live in a dry area, so I don't have use for a large storage unit. My only negative is that it does not hold a 1.5L bottle, which I have 4. Otherwise I would definately recommend this product. Shippng box was flimsy and product NOT well packed. Bought 4 one arrived damaged, customer service was extreemly helpful and shipped out a replacement the next day.